The ACC Digital Network shared their first video today with the Sports Techie community blog starring Louisville’s Rick Pitino. Pitino becomes the newest head men’s basketball coach to join the Atlantic Coast Conference when the Cardinals become an official member this July 1st. As more and more collegiate athletic conferences and leagues diversify membership because of sport business reasoning, it is our pleasure and honor the continue covering the highly traditional, yet cutting edge, ACC Digital Network, and their latest information, technology and trend-setting operational news released out of Charlotte, North Carolina. The ACCDN continues to deliver to loyal and new fans immediate behind the scenes access to all existing institutions and the latest updates about the newest member school. Most fans have probably never seen this caliber of high profile coaches such as these four reminiscing and chatting in such a relaxed atmosphere as they share treasured personal stories and talk about their love of the game that is contagious to their players, staff and students/alumni, as well as recruits and sponsors. 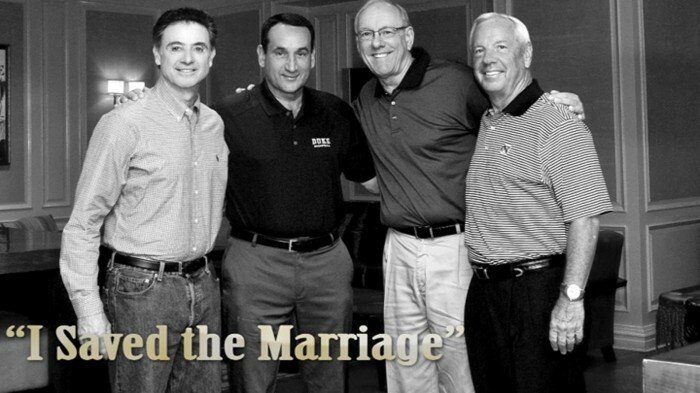 The premier feature entitled “I saved the Marriage” is the first of six inspiring videos the ACCDN filmed captured when the four Hall of Fame Basketball Coaches in the ACC took a quick break together at the prestigious conference meetings held on Amelia Island, Florida. Fans who pay attention to the ACC Digital Network closely, might also notice the use of the ACC Digital Network new branding logo. The fresh look, set to be launched everywhere on July 1, embraces the relationship with the ACC and their new brand marks, while signifying the progressive vision the Atlantic Coast Conference had when launching the network in 2011 with Raycom Sports and Silver Chalice. It is easy to see how the ACCDN continues to grow as the go-to source for basketball fans that want to keep up with their favorite collegiate sports programs and teams by providing immediate digital access to game highlights, historic footage and storylines across the conference. The ACC Digital Network (theACCDN) is a joint venture between Silver Chalice, a fast-growing digital sports and entertainment media firm and Raycom Sports, a long-time television producer and partner of the Atlantic Coast Conference. The television-quality, cross-platform digital video network covers the spectrum of one of the nation’s top intercollegiate athletic conferences, featuring both live programming and original on-demand content throughout the entire year. 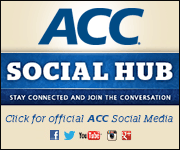 All ACCDN videos are viewable on the web site, the ACC mobile and tablet app, as well as various streaming and connected mobile and TV devices such as Amazon Fire, Apple TV and Roku. For more information, visit theACC.com and follow @theACCDN on Twitter and Instagram. Sports Techie, Our gratitude goes to the ACCDN marketing and audience development departments for the content and images for our readers to enjoy. I learn a great deal every time I write a blog and this was no exception. Coach Pitino works out at 5:30 am which tells you about his work ethic and enthusiasm as Head Coach of the Louisville Men’s Basketball program, a perennial National Championship title contender. My Dad was as a graduate assistant for Michigan State University, Head Coach, John E. Benington, back in 1967 when I was a one-year old in Lansing, so to hear these four living coaching legends go at it about the good ol’ times reminds me of how things where in the college basketball back in the 1960’s, 1970’s and 1980’s, and how they have stayed the same today because of these four masterminds. What does change is the ACCDN, staying up on the latest sports tech product, solutions and systems to keep their fans digitally happy. Use the official ACC mobile app to keep with #theACCDN. Blogging about this story makes you wonder about all the assistant coaches over the college basketball seasons nurtured at Duke, North Carolina, Syracuse, and Louisville, who will one-day, or have already, stepped forward at these top universities and conference, or as another colleges’ Head Coach, generating new coaching cliques when these four are finally retire as winners. Let’s all hope that is no time soon. Pay it forward if you are a youth coach, the rewards are priceless, ask these collegiate pioneers who where around before and after, smartphones, texts and emails. Playing five-as-one, “Hoosiers” style, wins games. Congratulations to the San Antonio Spurs for proving how to win as a team at the highest Professional level and winning the 2014 NBA Championship. I am positive these four ACC living legends would agree and may even discuss this topic in an upcoming episode.